I posted this on my Instagram a couple days ago and now here is the full recipe! I meal prepped this and trust me, it is perfect for leftovers. I have been so busy lately (haven’t we all? ), and I have really needed an easy meal that didn’t lose flavor or have a weird texture when reheated. 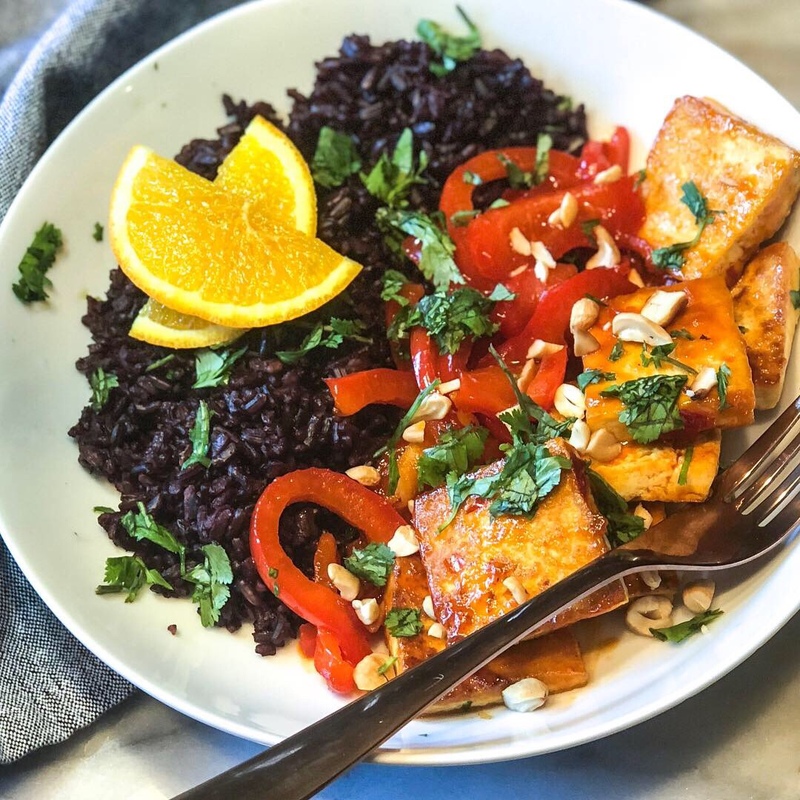 This Buffalo Thai Tofu is my take on Asian fusion. Such a fun way to switch up your weekly meal prep. This is also a relatively inexpensive meal and nutrient dense. With the Super Bowl this weekend, many people are hosting parties. Make double the amount of sauce and toss your wings (or cauliflower wings) in it! It’s that good! The good in this? Tofu is a affordable plant based protein. I purchased my tofu at my local grocery store for 1.79! Tofu is made from soybeans and is a good source of calcium, iron and heart healthy fats. You can’t go wrong with this dish. To prepare tofu, remove from packaging, drain and rinse. Wrap tofu block in paper towel and place on cutting board. Place cast-iron skillet on tofu block and let sit for 10 minutes to remove moisture. After 10 minutes, slice tofu to desired size/shape. In non-stick skillet, heat 1 tablespoon of coconut oil. Cook tofu in batches, about 2-3 minutes per side or until crisp. If tofu is in chunks, sauté until golden brown. Add additional coconut oil if needed. Set cooked tofu aside. In same skillet, sauté red bell pepper for 2-3 minutes. Add chili sauce, buffalo sauce, orange zest and ginger. Bring mixture to a boil. Reduce heat and add tofu slices. Simmer for 5 minutes. Top with fresh cilantro and crushed cashews, if desired. Serve with rice and/or more vegetables.